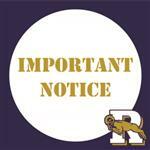 Please click the link below to view a letter from the Superintendent regarding graduation. May 15, 2019 @ 7:00 p.m.
We are excited to announce that Ringgold School District now has an App. Click the link below to a video with all the app has to offer. The District App is available in both the Google Play Store and Apple App Store. Effective July 1, 2018 Ringgold School District will have Central Registration. All new students to Ringgold School District will register at the Central Office located at 400 Main Street, New Eagle, PA 15067. Please schedule appointment by calling (724) 258-9329 x1120. Be sure to have your child's birth certificate, two (2) forms of proof of residency, immunization records and the name, address and fax number of your child's former school (needed for records request).